Did you know that Gubler is a children’s book author? Well, the actor has just released a new book entitled Rumple Buttercup: A Story of Bananas, Belonging, and Being Yourself that is really quite self-explanatory — minus the part about bananas. It’s a strange, quirky, and delightful story, and nobody should be surprised that it’s coming from an actor who showed up to the set of AM2DM today fully in costume before taking off the mask a la The Masked Singer. In addition to talking about this book, this interview’s a great chance to hear Gubler actually open up about the legacy of Criminal Minds and playing Spencer Reid for so many years. It’s not a gig he ever expected, but he adores this character and has so much respect for who he is and what he represents for so many people out there — he’s a hero, someone with a big heart and someone who is going to do everything within his power to do good for other people. Entering season 15, we also know that Spencer is in a rather precarious position, given some of what JJ told him in the finale. The idea of these two characters being involved romantically is just about as polarizing of a subject as we’ve seen with this show — we know some people are screaming with jubilation over the idea, whereas some others are cringing. Was the love between them ever this kind of love? We know that JJ is a better liar than perhaps Spencer thinks … so we’ll get some sort of information on this subject come the season 15 premiere, whenever that may be. Want to watch a related Criminal Minds video on this subject? Then you can do that at the bottom of this article! On the other side of watching it, remember to subscribe to CarterMatt on YouTube for more insight, and remember to check out our full Criminal Minds playlist. The end of this video is simply a big nostalgia-bomb for longtime fans as Gubler takes part in a trivia contest, one where he takes a look at a picture of him and has to guess, based on Reid’s hairstyle alone, what season it is from. 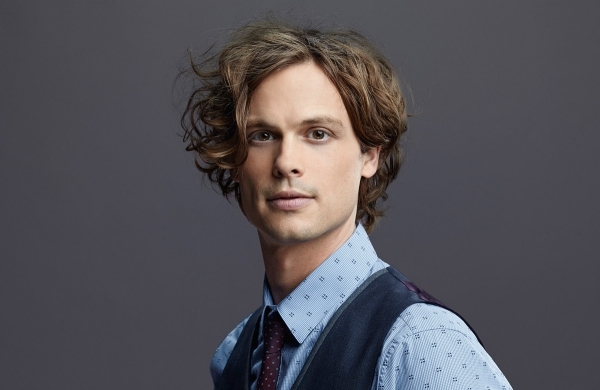 Reid’s been on such a hair journey through fifteen seasons! Matthew jokingly calls the early-season version of himself an “earthworm” and since that time, he’s sprouted a more robust head of hair that is wild and does its own thing (much like our dog when we ask her to sit or come when she’s called). There are still some episodes of Criminal Minds season 15 left to shoot, so expect see Matthew around for a lot of it. Reid is going to have potentially much bigger arc than he did in season 14, which was surprisingly quiet on the Spencer front. We know, for example, that Jane Lynch will be back for at least one episode as his mother Diana. Want to see the latest Criminal Minds spotlight article? Then be sure to visit the link here, as that is where you can get a little more information on the future for one Penelope Garcia!